The ability to predict weather patterns has helped us make clothing choices and travel plans, and even saved lives. Now, researchers in Virginia Tech's College of Natural Resources and Environment are using similar predictive methods to forecast the growth of trees. In a study published in Ecological Applications, researchers used ecological forecasting to predict how changes in temperature, water, and concentrations of carbon in the atmosphere in the Southeastern United States may affect the future growth rates of trees. The paper brings together efforts from two projects funded by the U.S. Department of Agriculture. In the first, known as PINEMAP, hundreds of researchers collected forest growth data from the past 35 years and developed mathematical models to quantify how pine forests may respond to climate change. The second project, led by R. Quinn Thomas, assistant professor of forest dynamics and ecosystem modeling in Virginia Tech's Department of Forest Resources and Environmental Conservation, focused on quantifying uncertainties in how climate models predict how forest and agricultural ecosystems, along with decisions like the timing of crop or forest harvest rotations, influence climate temperature and precipitation patterns. Thomas noticed similarities between these two projects and the way weather data can help meteorologists predict future weather patterns. This led him to develop a new research project to forecast forest productivity through the middle of the 21st century. "I realized that we could use the past to inform the future," Thomas said. "Historical observations on tree growth and weather can be fed into a mathematical model describing how forests grow, making it more accurate over time. This is similar to how weather forecasts are updated as new weather data becomes available." Thomas and team members from his department — master's student Annika Jersild, postdoctoral associate Evan Brooks, Associate Professor Valerie Thomas, and Professor Randolph Wynne — built on data and concepts from the two projects to develop a common analytical framework that can be combined with predictions from climate models to produce an outlook for the future. Data on the diameter of trees, the number of leaves produced in a given year, and how much water is evaporated from the forest are all fed into a model representing the process of forest growth. Then, using statistical methods similar to those used in weather forecasting, the model is adjusted based on those data to account for uncertainties. "This new study allows us to put a level of certainty or uncertainty on those estimates, so we're able to say 'there is an 80-percent chance that the forest will grow faster over the next few decades,'" explained Thomas, who is also affiliated with the Global Change Center housed in Virginia Tech's Fralin Life Science Institute. 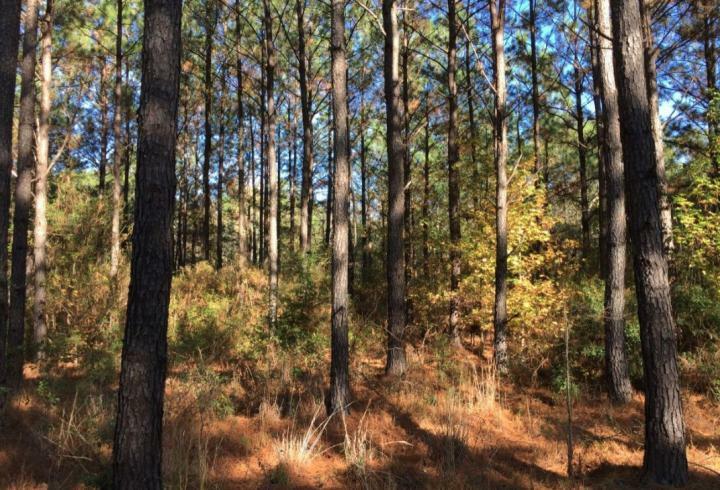 Researchers looked specifically at conditions in the Southeastern United States, often referred to as the "wood basket of the United States" for its productive forests. They focused their attention on planted loblolly pine plantations, an important source of timber for the region. "We found that in this region, there will be about a 30-percent increase in productivity between now and the middle of the century," Thomas said. He cautioned, however, that there is uncertainty around those predictions, depending on specific parts of the region. "The largest gains are forecasted in Virginia, and there's high confidence that we'll see that increase in productivity there. In Florida, however, the increase in productivity is expected to be lower, and we may even see a decline in productivity between now and mid-century," he explained. Despite these uncertainties, however, the future of ecological forecasting looks bright. "I'm excited to see how this particular forecast does over the next few decades and to update it as we learn more about how forests work and as more data become available," Thomas said. "Furthermore, this system sets a foundation for this process to be used in the forestry industry to predict other aspects besides productivity. Beyond that, the study is an example of how ecological scientists are starting to think about becoming forecasters in a way similar to how we've been forecasting the weather, and that's very exciting." The study, "A mid-century ecological forecast with partitioned uncertainty predicts increases in loblolly pine forest productivity," is available online in Early View format in advance of publication in an upcoming issue of Ecological Applications.